Congratulations! If you’re reading this blog it means you made it through one of the most stressful times of the year: Tax season. Not surprisingly, the stress caused by taxes is so widespread, April is officially known as Stress Awareness Month. Each year, since its inception in 1992, health care professionals and experts have joined forces nationally during the month of April to raise awareness of stress, its side effects and how to manage it in your life. Whether you’re young or old, chances are you have experienced stress at some point in your life. In fact, statistics show that 77% of Americans regularly experience stress and stress-related symptoms. Furthermore, 1 in 5 reported feeling extreme stress symptoms including shaking, heart palpitations and depression. While stress can be dangerous for anyone, it– like many other illnesses–, is particularly dangerous for our vulnerable elderly loved ones. Not only does stress increase their risk for heart disease by 40%, heart attacks by 25% and strokes by 50%, stress is “widely believed to accelerate biologic aging. Many studies have confirmed the negative effects of stress on immune system function and hidden inflammation. Considering the potential danger stress poses for our elderly loved ones, knowing the warning signs and effective ways to help reduce stress could save their lives. Keep reading to learn more about how you can save your elderly loved one by reducing their stress. Changes in eating habits- Are they overeating or do they have a loss of appetite? Mood swings- This will often present itself as irritability, prolonged sadness or depression. Forgetfulness- As your elderly loved one begins to feel stressed, it may cause them forget stuff that comes normally, or have trouble concentrating on things. Physical signs- These signs typically include body aches, increased sickness and trouble keeping regular sleeping patterns. Isolation- You may notice your senior becoming less and less interested in socializing with others. This can be a sign of stress and/or depression. Now that you know what to look for, here’s some ways you can reduce stress. 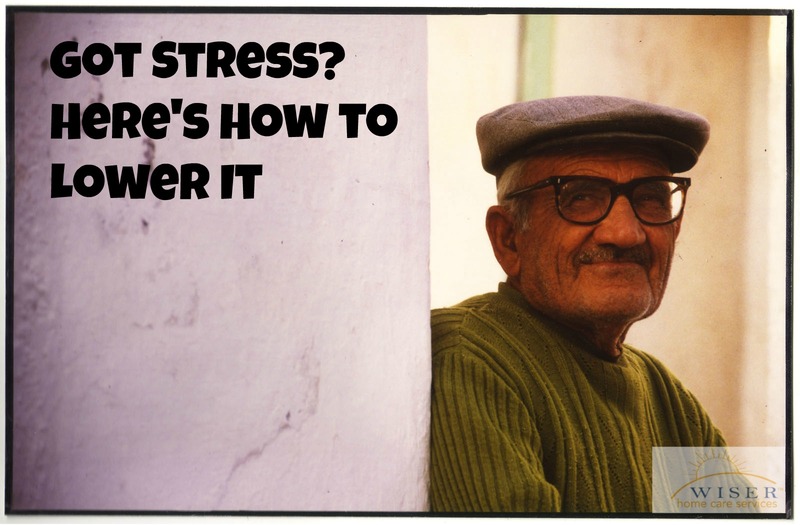 Find short term solutions- Often senior stress is caused by all the looming changes they are experiencing. Have your elder write down their worries. Then take a little time each day to figure out a short term solution. Remember: It doesn’t matter how many steps it takes to get to where you want, as long as you get there. Turn off the TV and pick up a book- Increased media time, especially news channels, is linked to increased stress and trouble sleeping. Encourage your elderly loved one to spend time reading a positive book or poem rather than watching tv. The Chicken Soup for the soul is a great pick-me-up series. Meditate and Practice Breathing- Learning how to calm oneself through meditation and slow, deep breathing is proven to be a great way to reduce stress. Set aside time each morning for your senior to sit, close their eyes, and meditate on positive phrases. Having them say them aloud and repeat them is another great way to instill stress-reducing habits. Spend time with a Pet- There’s just something special about playing with, petting or snuggling an animal. It is cathartic and stress relieving. In fact, many communities have visiting pet programs. In which volunteers bring pets to senior homes to provide companionship for elderly loved ones. Get outside and be active- Not only will being active increase the overall health of your elderly loved one. The endorphins released during exercise are known to help increase happiness and decrease stress. Now that you have an idea of how to prevent stress, go out and have fun. As always, If you care for an elderly loved one and would like help developing a care plan please feel free to contact us. We can help your family establish a care plan to personally accommodate your loved one’s needs.